Yes! It's time to draw random stuff. Request anything! If you want something specific, post a picture or a long description, but other than that.. tell me a thing and I'll give it a go and draw as detailed pic as I'm inspired to draw. Might vary from sketches to more detailed stuff! Examples.. wolf, cartoon character, pumpkin, cookie, snow storm, magic wand, Sleipnir the horse, fairy in flip flops.. You get the picture! Post a subject, I'll draw! 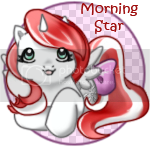 Thank you so much Calico_Star for my beautiful siggy! Anyway, the reason I'm up so late, is that I decided to draw a finished piece of the tiger. I'll just post a link to deviantArt, here and when I finish the cow & tiger pic and the others, I'll post them to this thread. Well, now I'm off to bed, good night all, and the pictures are hopefully here tomorrow! could i put him in my album?? I drew this while TP was down so I didn't quite remember what I was supposed to draw.. but close enough! I'll post the rest tomorrow! Oh, but this thread is in the Other Artwork discussion room, hence, only non-pony stuff! ;D I wouldn't want this to become just another adoptable thread, that's the reason. Thanks, cannibalcow, I noticed cows are quite difficult to draw! I guess it only comes with practise, hehe. More pictures in the evening! And that's a detailed description!!! Sheep and fox pictures coming next.. but for now.. Here you go FP and SS! I think she's from Death Note! Some Misa-girl with sketchy Photoshop colouring. Sleepy Halloween cats! It's been a long day carving the pumpkin, I bet..!